We are looking for more information on churches in Nebraska. If you have information or suggestions, please contact Bev Hopkins. 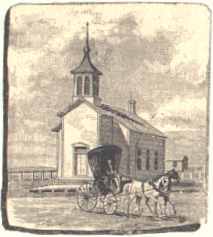 Churches - chapter from Johnson's History of Nebraska, 1880. Rev. Moses Merrill & his wife, Eliza Wilcox, "First Missionaries to NE" - from Sheldon's History & Stories of Nebraska. Seventh Day Baptist - Biography of Rev. John P. Gardiner, in Compendium ...Western Nebraska, 1909. "Local Catholic Church History and Genealogy Research Guide" by Ann Mensch. Franciscans in Nebraska, The - by the Rev. Eugene Hagedorn, O.F.M., 1931. Knights of Columbus - Nebraska State Council Proceedings, 1905-1926. "Father DeSmet", first Catholic missionary - from Sheldon's History and Stories of Nebraska, 1914. The Rev. M.E. Dolan (1872 -) Bio. in "Compendium ... Western NE", 1909. Church of God - Bio for Andrew F. DUGGER, Semi-Centennial History of Nebraska, 1904, p 312 (photo, scan down for brief article). York County - Congregational Church, York NE, Consecration Roll from NSGS NE Ancestree, Vol. 1 no. 1. St. George Antiochian Orthodox Church in Kearney, Buffalo County website by Mona Houser. Farmer Boy Who Became a Bishop, The - 1911, by Anson Rogers Graves (Dec 2002). Latter Day Saints - "Mormons"
ME conference minutes found in this special project. Varies by location & by year. "A Frontier Life: Sketches and Incidents of Homes in the West", 1902, by Rev. Charles Wesley Wells. Hanover Presbyterian Church death records - from NSHS NE Ancestree, Vol. 4, no. 2. Records of the Presbyterian Church, Bellevue, Nebraska (Dec 1850 - Mar 1864) (Apr 1854 - Apr 1864) from Nebraska & Midwest Genealogical Record, Vol VIII, 1930. The Rev. Richard Hovis (1923, WY - 2003, NE) - Published in the Grand Island Independent, 17 Dec 2003. For his wife Margaret Hale Todd, see 22 Aug 2002. The Rev. Dennis A. Olsen (1947, Omaha, NE - 2006, Onawa, IA) minister of Christian Church - Published in the Grand Island Independent, 25 Oct 2006. The Rev. Dr. Roger Harp (1948, Tulsa, OK - 2007, NE) Published in the Grand Island Independent, 21 Feb 2007. NEW Specialty Newspapers - see selections under "Religion"
Czechs in Nebraska Religion chapter - From the Ethnic section of the NEGenWeb Project Resource Center.